After their election in 2010, ministers embarked on a campaign of ‘sanctions’, that is, withdrawals of benefit, against claimants of Jobseeker’s Allowance. They inherited a level of 533,000 a year, but drove it up to a peak of over one million in the year to October 2013, while also increasing the length of the penalties. Numbers of sanctions have since fallen, but only to a rate which is similar to the highest seen before 2010. Employment and Support Allowance sanctions have also increased. Britain’s voluntary sector has produced a forest of reports documenting the huge negative impact of the sanctions campaign on their vulnerable service users. But throughout, the government has tried to minimise it. It happened without any announcement, taking claimants and voluntary organisations by surprise. While official statements since 2013 have frequently highlighted the falls that have taken place, during the run-up to the peak they always denied that there was any clear trend. And the DWP routinely claims that ‘sanctions are only ever used as a last resort,’ ‘in a small (or ‘tiny’) minority of cases’. Similarly, it has persistently denied that sanctions drive people to food banks, in spite of the evidence. It is not clear why the government should wish to play down sanctions. One possible explanation is that they want to head off criticism from their own backbenchers. If so, they have been very successful. Tory MPs frequently rebut complaints about sanctions by repeating the DWP’s claims. But these are misrepresentations, supported by misuse of statistics. The key misrepresentation by the DWP is to present the percentage of JSA claimants who are sanctioned each month (around 5%) as if it was the percentage who are sanctioned ever. But the typical claim lasts around five months, so the chance of being sanctioned at some time during your claim is much higher (more like 15%-20%). Many people move frequently between JSA and short-term jobs, so their chances of being sanctioned during, say, a five year period, are higher again. Another problem is that all of the figures given by the DWP on the scale of sanctioning are understatements. This arises primarily from the DWP computer system’s practice of recording only the latest status of each sanction case. Sanctions which are overturned following challenge are shown as never having happened at all, even though the claimant will have lost their money prior to eventual refund. Also, no figures have yet been published for sanctions on the growing number of claimants transferred to Universal Credit. The resulting scale of understatement is large. For the year to September 2015, the DWP’s Stat-Xplore website is currently showing 311,806 sanctions, but the true figure is probably one third higher, at around 414,000. Astonishingly, the DWP’s computers do not record the dates of claimants’ ‘failures’. Consequently, even the Department itself does not know how many people are subjected to the extra-long sanctions (since 2012, at least 13 weeks and up to three years in some cases) which are imposed for second or subsequent ‘failures’ within 12 months. Such figures as are available on the number of times individuals are sanctioned are also understatements, because they exclude any sanctions overturned following challenge. 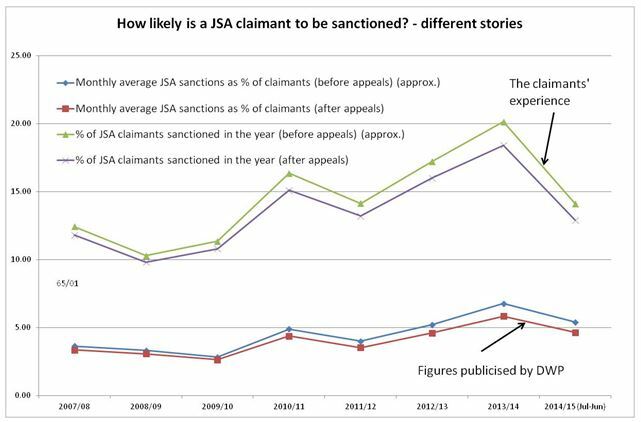 Even on this basis, a quarter of those sanctioned in 2014/15 were sanctioned more than once. Note: Monthly averages after challenges are from Stat-Xplore, with pre-challenge figures estimated by adding back successful challenges. Yearly figures for % of claimants sanctioned after challenges are from DWP Freedom of Information responses 2014-4972 and 2015-2187, with pre-challenge figures estimated using numbers of successful challenges and assuming that challenges shift two-thirds of sanctioned claimants from the ‘one sanction’ to the ‘no sanction’ category. This is a serious list of faults in the statistical reporting of what is a penal system profoundly affecting the rights, health and wellbeing of literally millions of citizens. Fortunately, since 2000 there has been some means of redress for this sort of problem in the form of the Statistics Commission and its successor, the UK Statistics Authority (UKSA). 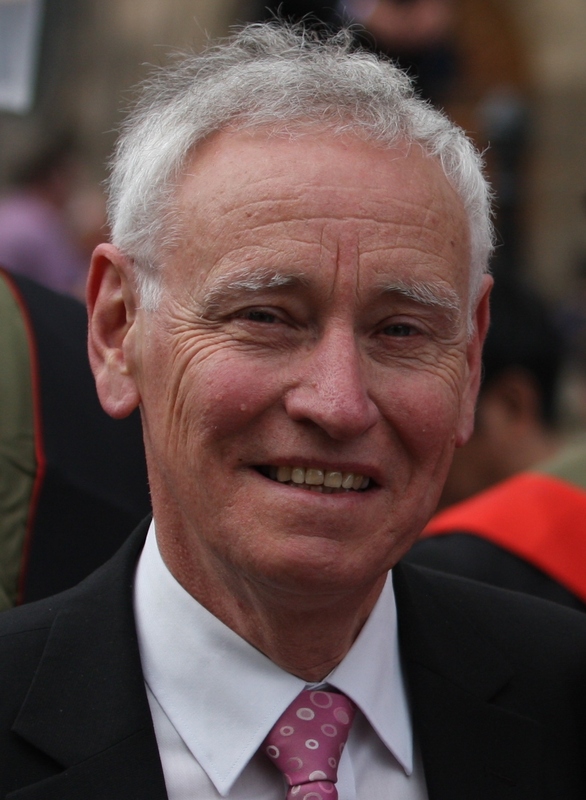 Following a typically misleading DWP press release of 13 May 2015, Jonathan Portes of the National Institute of Economic and Social Research complained to the UKSA. Its reply on 6 July effectively upheld the complaint. It must have been this that prompted DWP to publish a note on methodology on 17 July. However, this dealt with only a small part of the problem. On 27 July I followed up with a more comprehensive complaint. Once again, the UKSA was commendably prompt in upholding all my complaints and in a letter of 5 August it listed various recommendations it is making to the DWP for improvement of the sanctions statistics. To date there has been little response from the DWP. It has published new data on ‘hardship payments’, but this was planned anyway. It seems that the DWP may have become more cautious in the claims it makes about what the sanctions statistics show. But although it could easily have implemented quickly one of the key UKSA recommendations, namely to publish with each quarterly statistics release a statement of the proportions of JSA claims and claimants that have been sanctioned during the most recent one-year and five-year periods, it has not yet done so. Of course improving the main published statistics will take time, since it requires changes to computer systems. It will be necessary to keep a close eye on progress. We have not heard the last word on this issue. what a surprise, the governments putting out misleading (LIES!!!) statistics. And lets be honest, getting away with it!